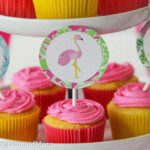 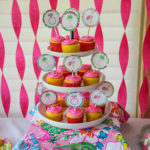 Cupcakes – Homemade lemon cupcakes with hot pink buttercream icing. 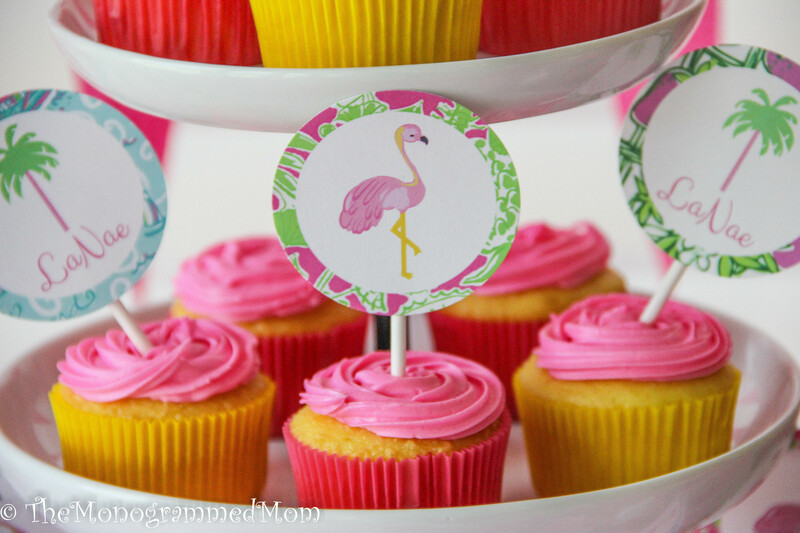 Toppers ordered from Etsy seller “lolapaperdoll”. 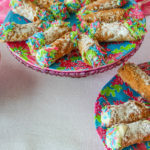 Canolis – Ordered from a local bakery and added our own bright colored sprinkles. 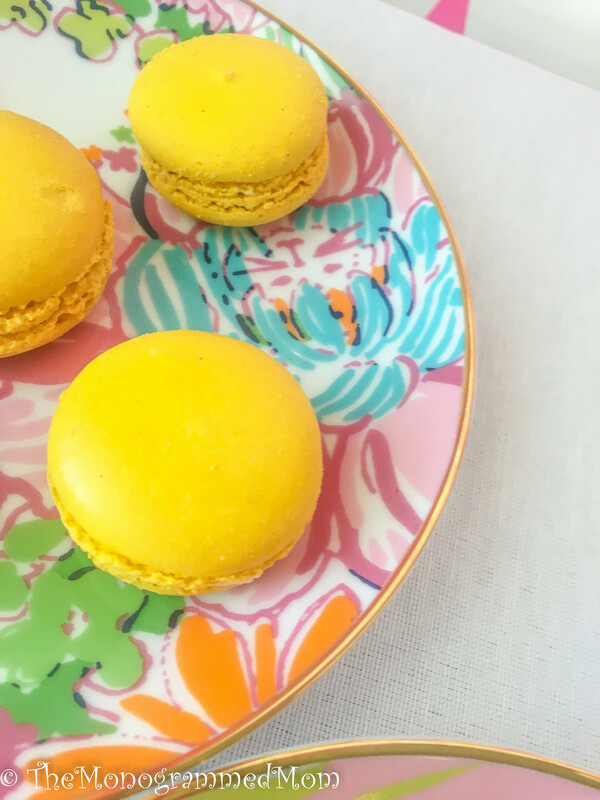 Served on my fave Lilly plates. 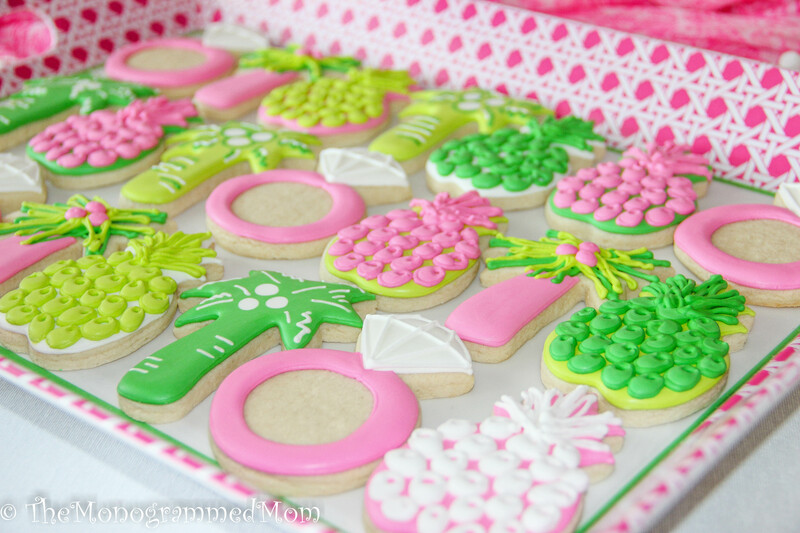 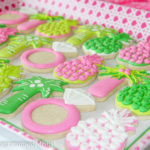 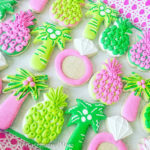 Sugar Cookies – My favorite local baker never ceases to amaze! 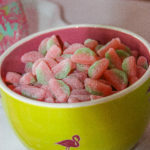 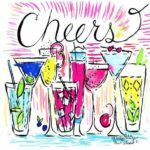 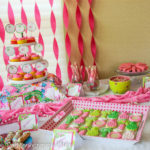 Check out Tiny Treats by Stephanie!! 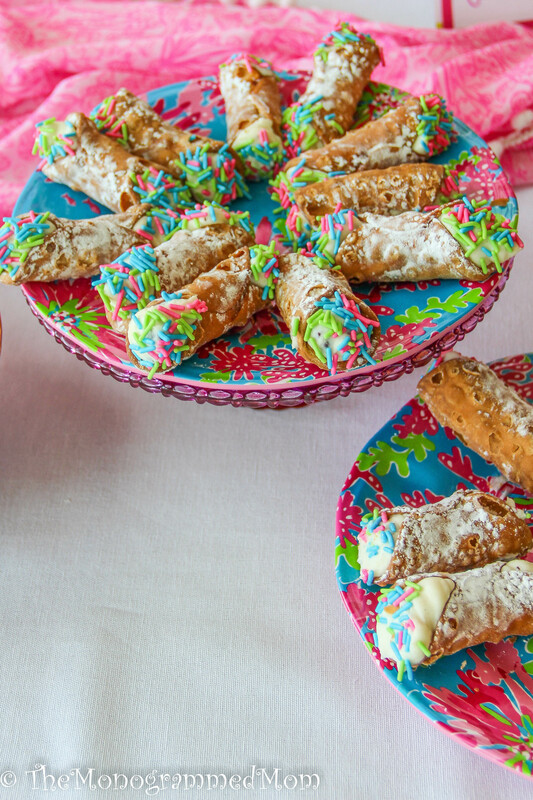 Pretzel Rods – Covered in white chocolate with sprinkles. 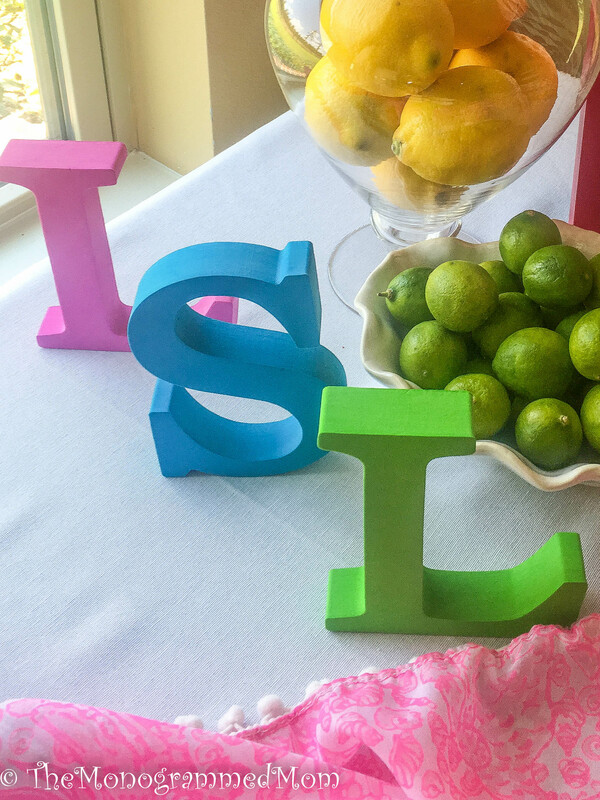 Displayed in Lilly wine tumblers. 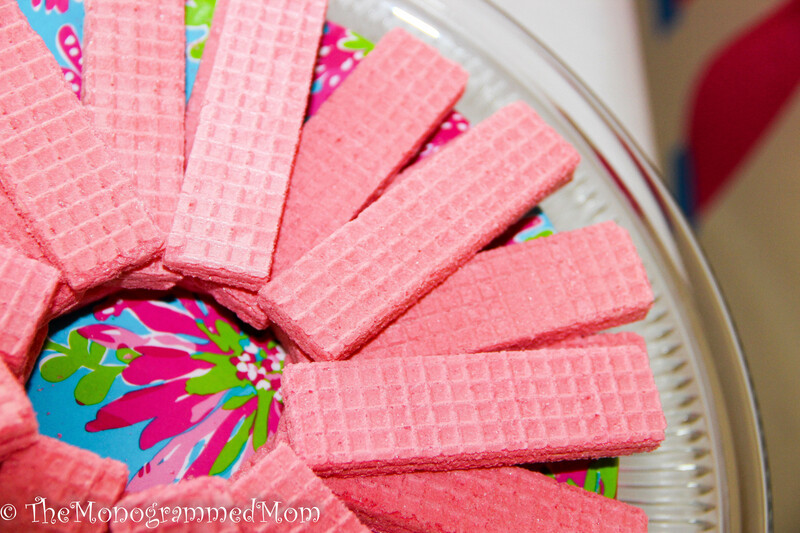 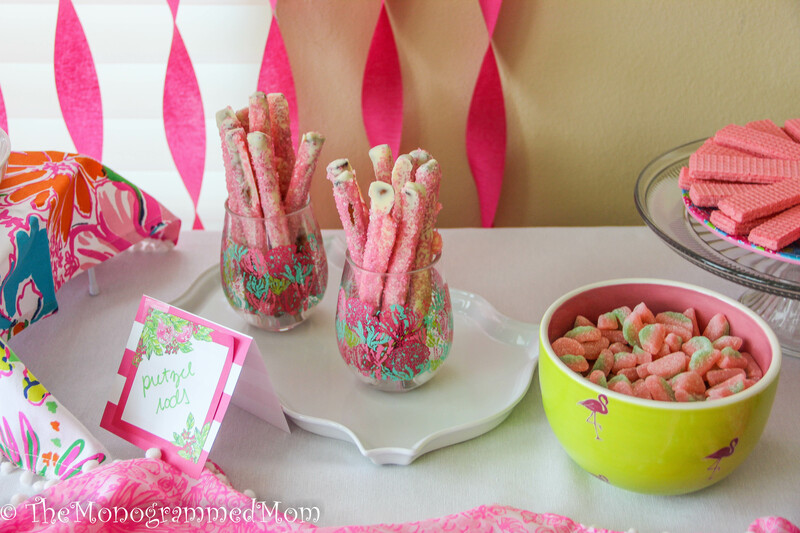 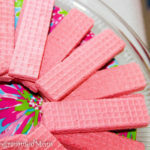 Sugar Wafers – Pink of course! 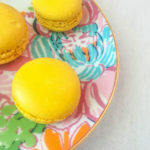 Macaroons – Lemon flavored. Served on my Lilly for Target cocktail plates. 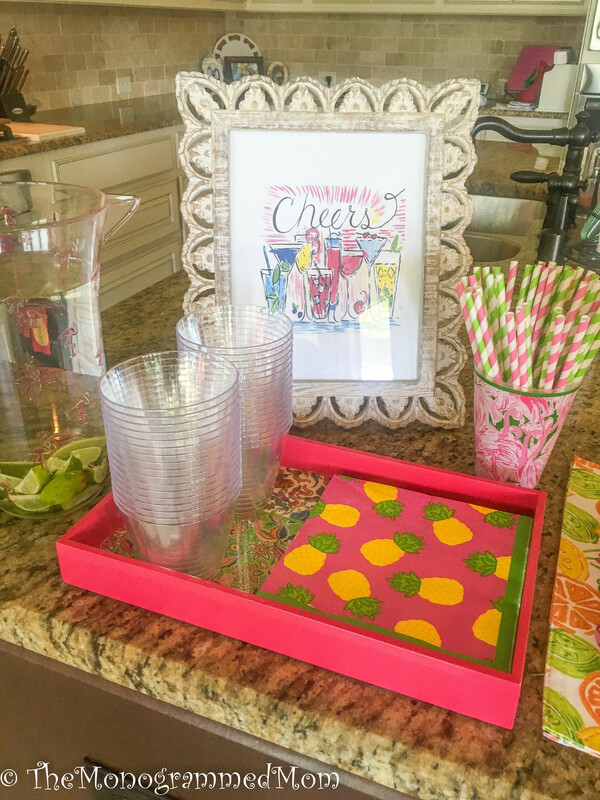 Cocktail Bar – Served Sparkling Rose, Sparkling Lemonade, and Chilled water with limes. 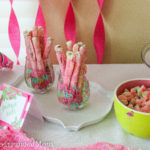 Paper straws from Target. 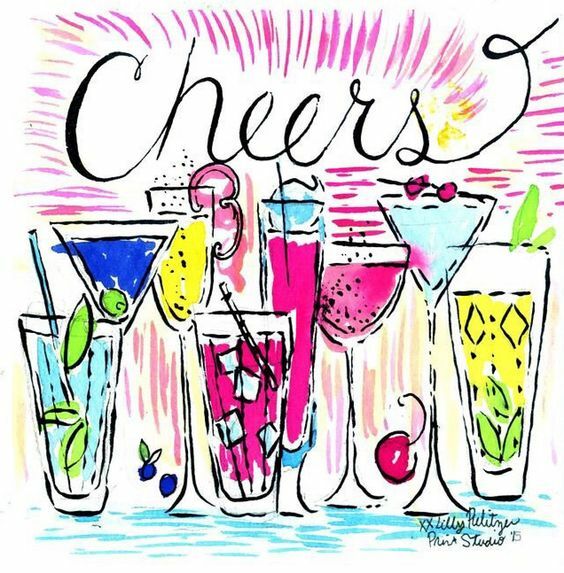 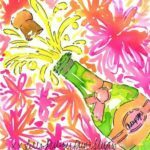 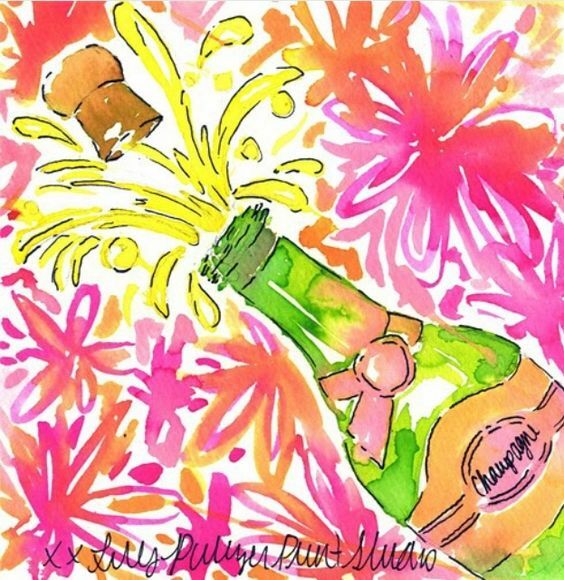 Found this adorable Lilly 5×5 print online and framed it! 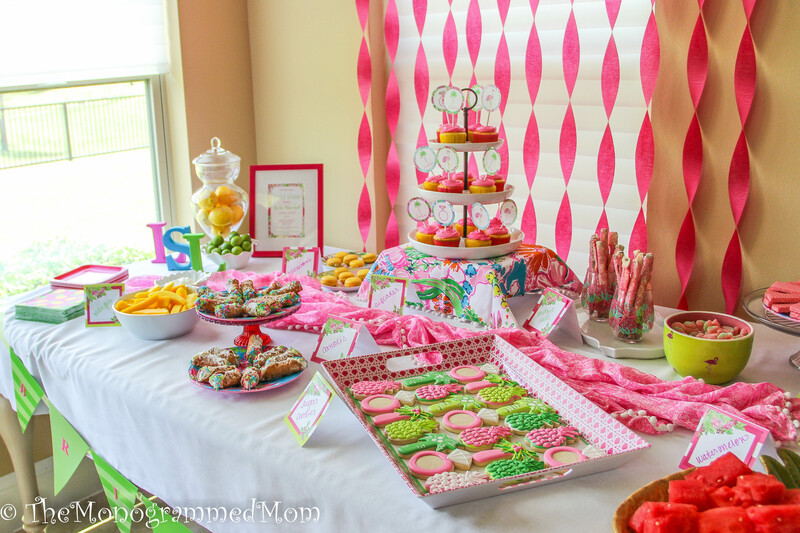 Behind the dessert table I hung hot pink streamers. 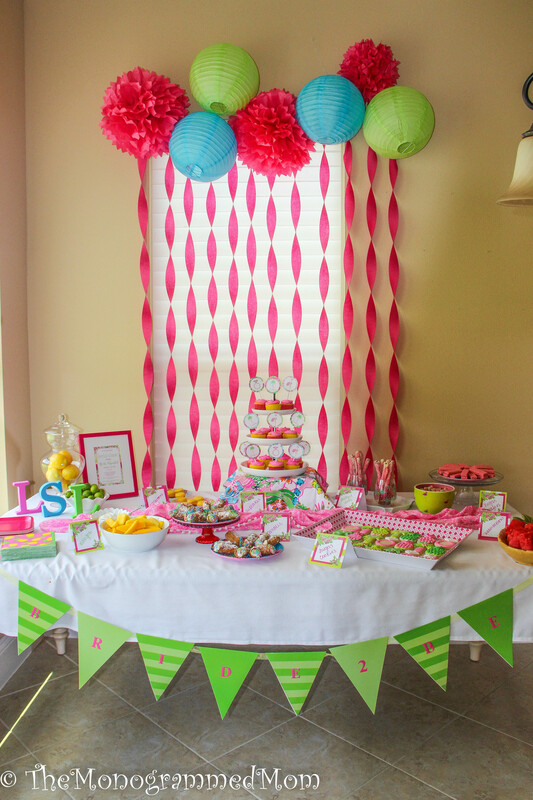 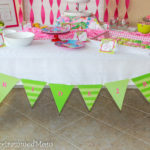 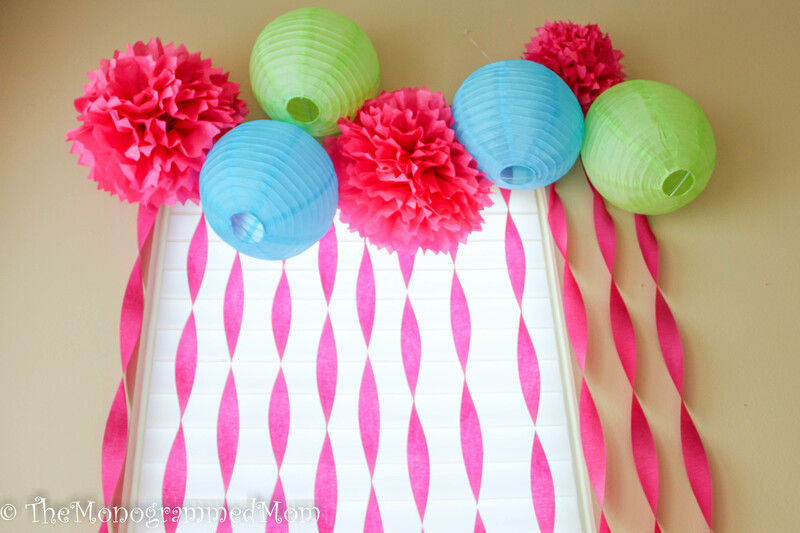 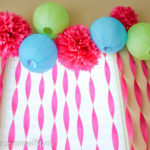 At the top of the streamers, I fastened lime green, pink, and aqua colored round lanterns and paper puffs. 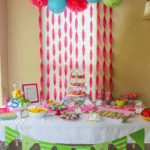 On the table I chose to use a white table cloth so all of the other decor would *POP*! 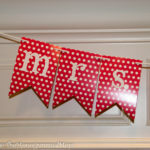 I hung a green bride-to-be banner across. 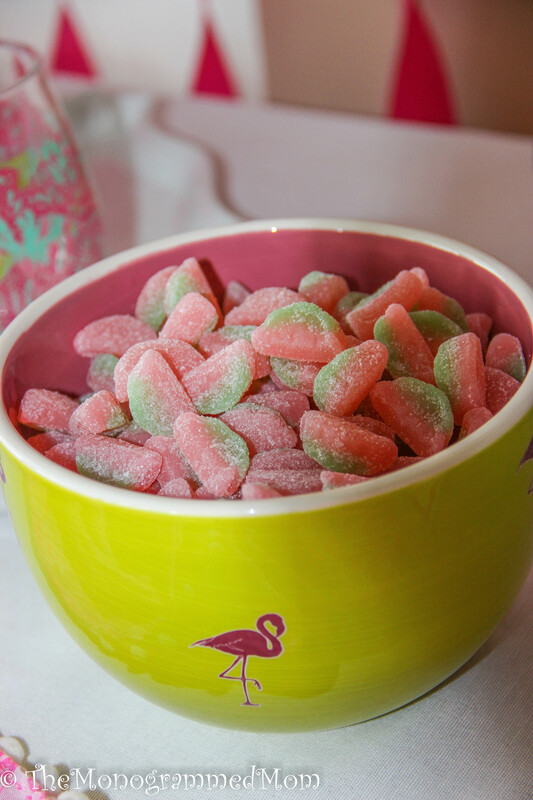 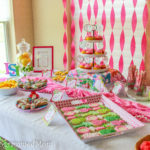 I brought out all of my favorite pink, green, aqua, and Lilly dishes to serve the desserts on. 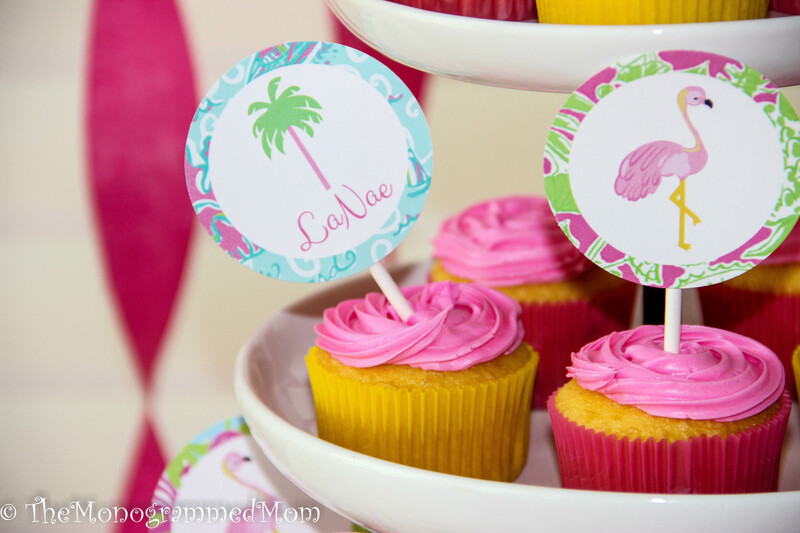 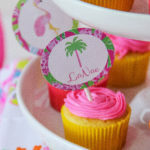 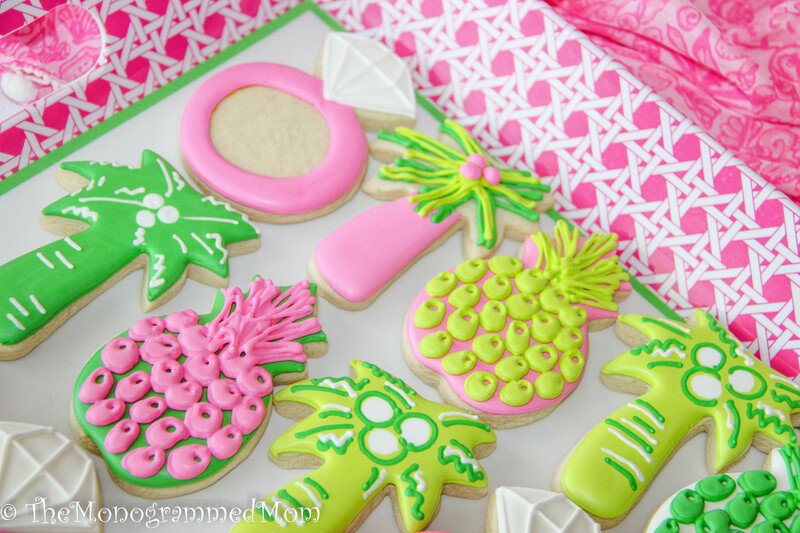 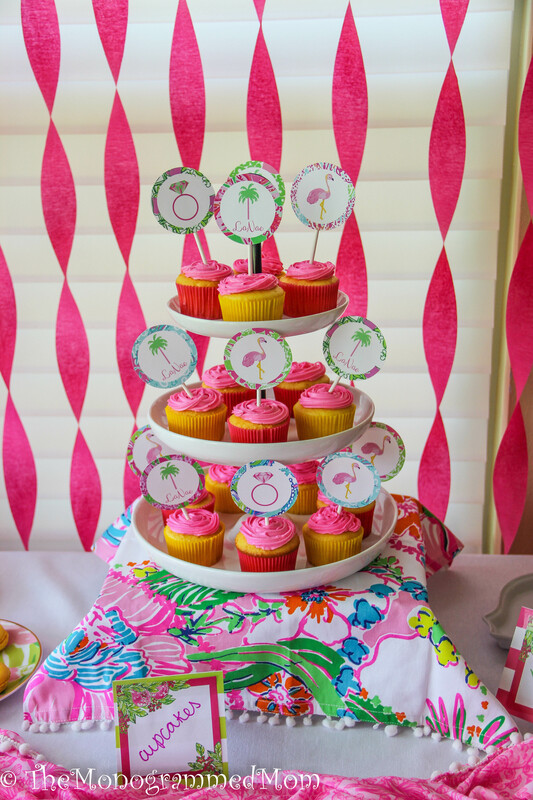 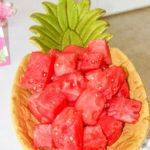 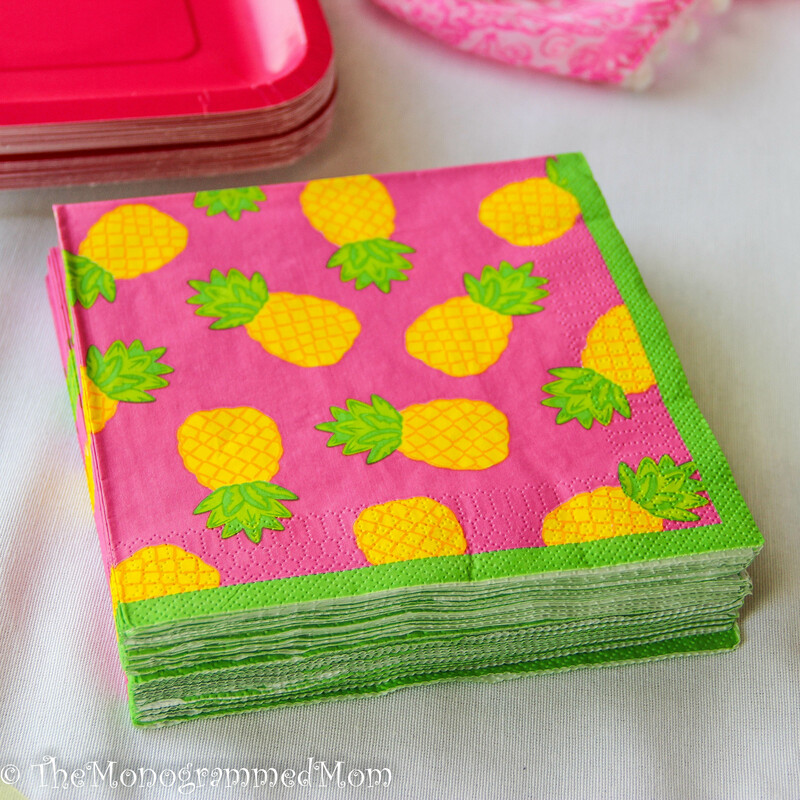 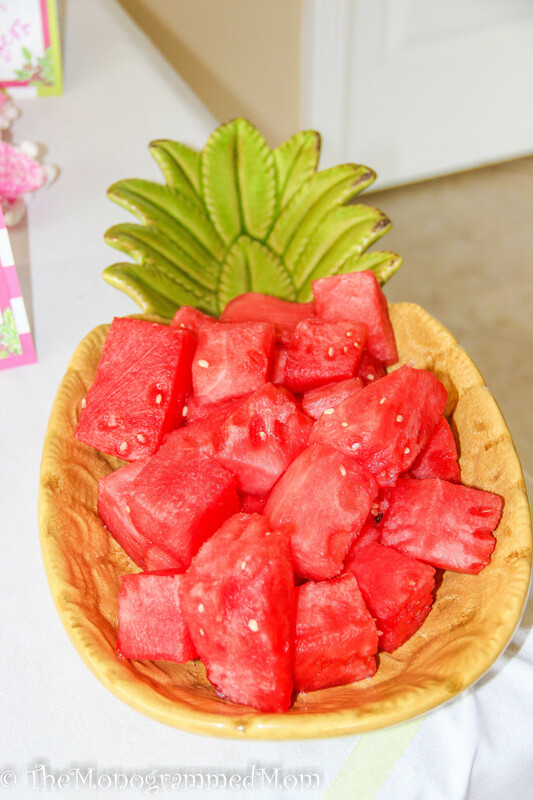 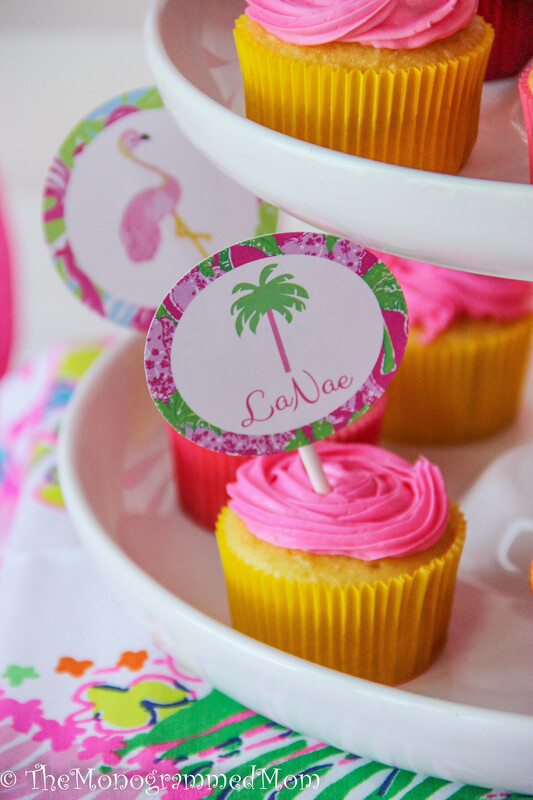 I found hot pink paper plates and adorable napkins with pineapples on them from Oriental Trading. 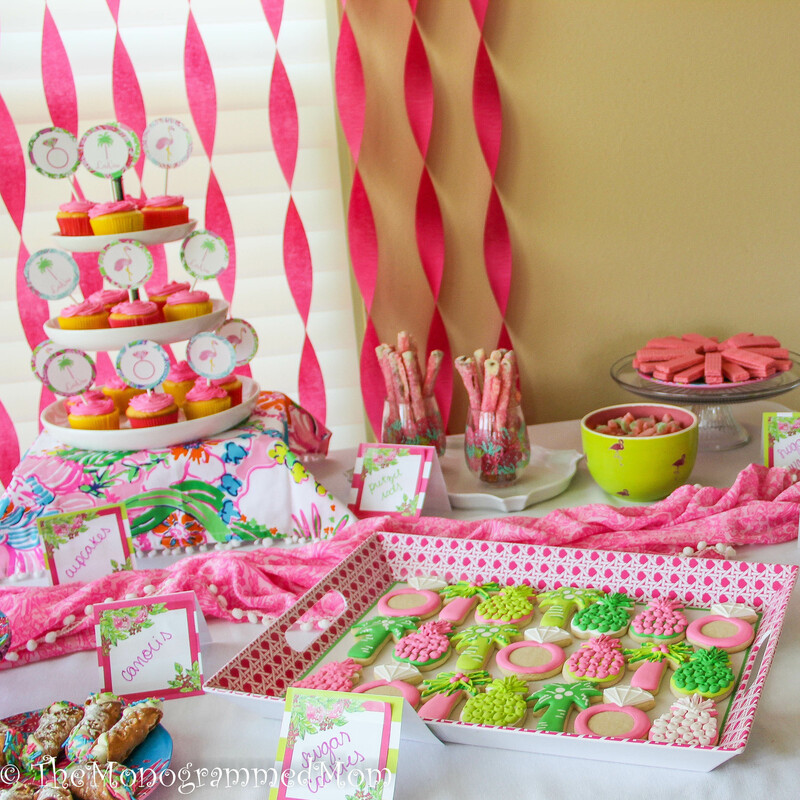 I also ran a Lilly for Target pink scarf down the middle of the table. 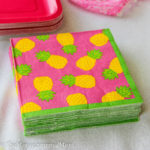 For food tags, I took striped scrapbook paper and fastened some Lilly post-it notes on. 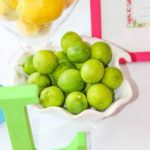 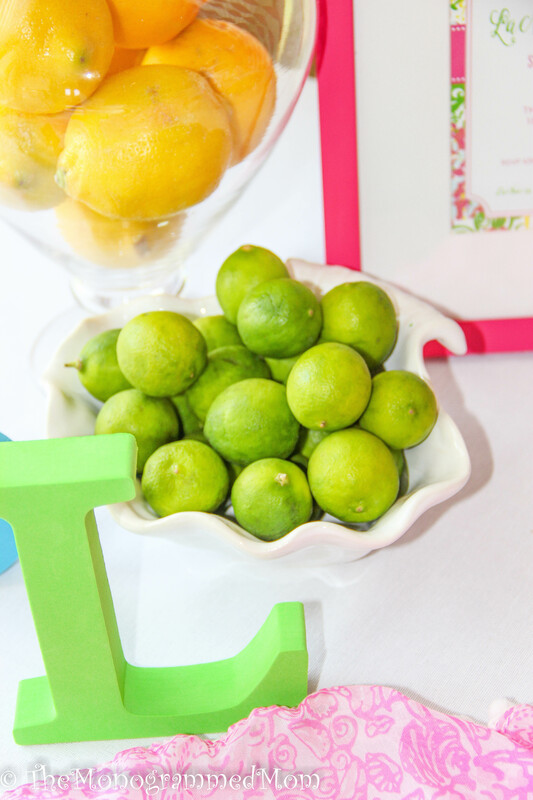 I also placed limes & lemons in a glass jar and shell shaped dish on the table. 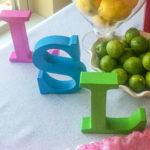 At Hobby Lobby I found the new bride’s monogram in the perfect theme coordinating colors. 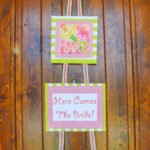 Lastly, I framed the invitation, because, well I just really loved it SO much! 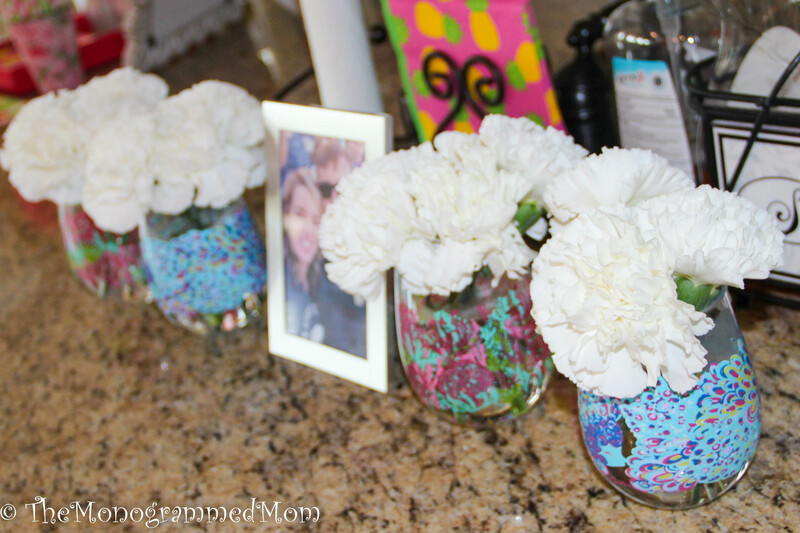 I placed white flowers in Lilly wine tumblers around a frame of the happy couple on my island. 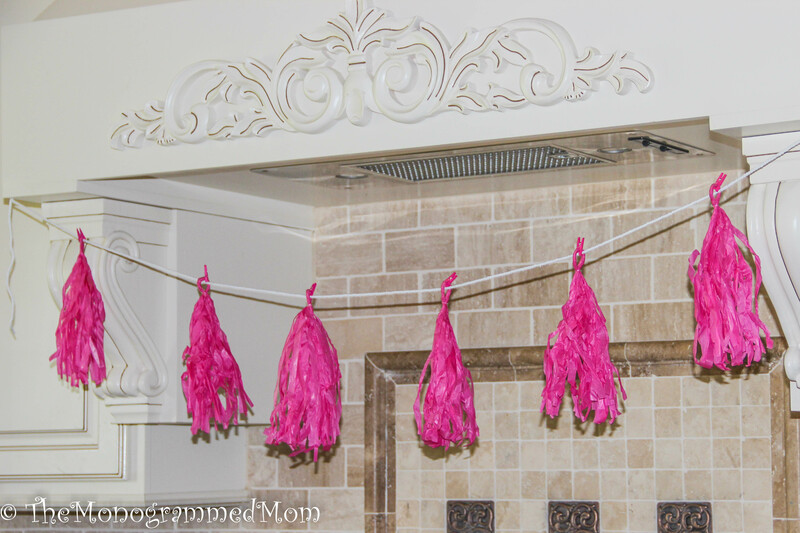 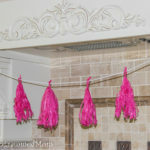 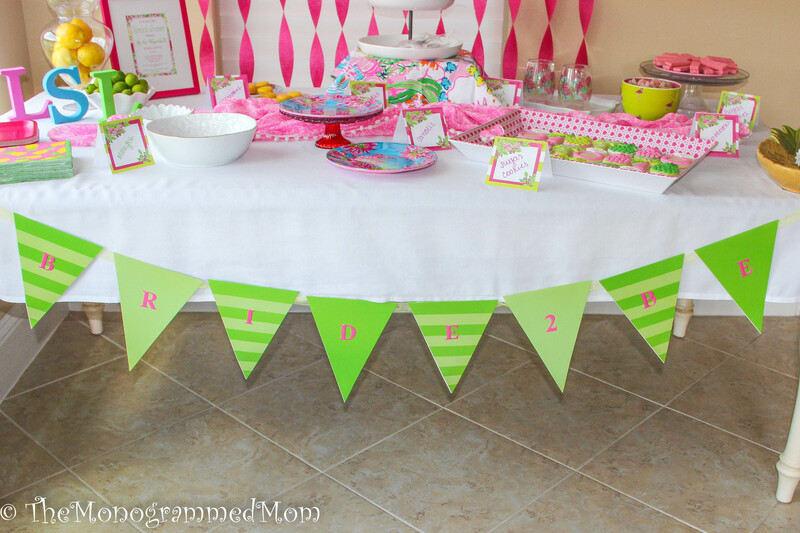 I hung several pink banners around the house (over the stove, on the mantle). 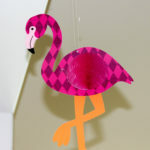 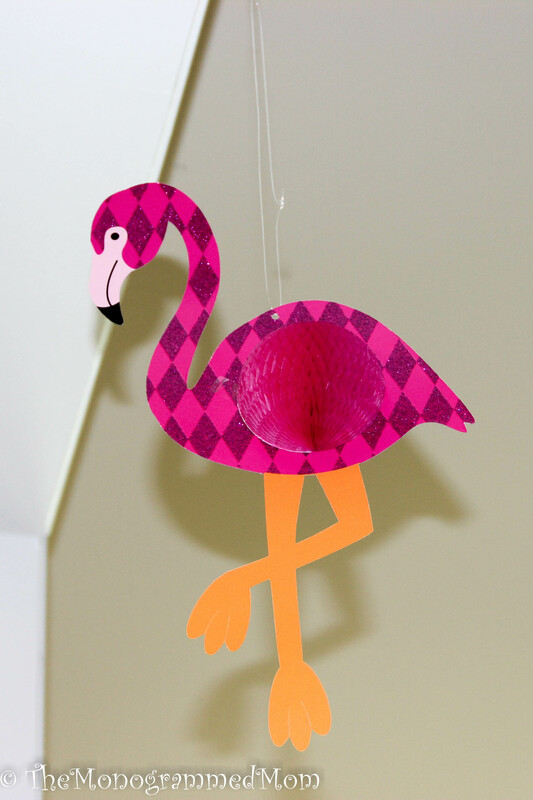 I also hung sparkly flamingos from the doorways. 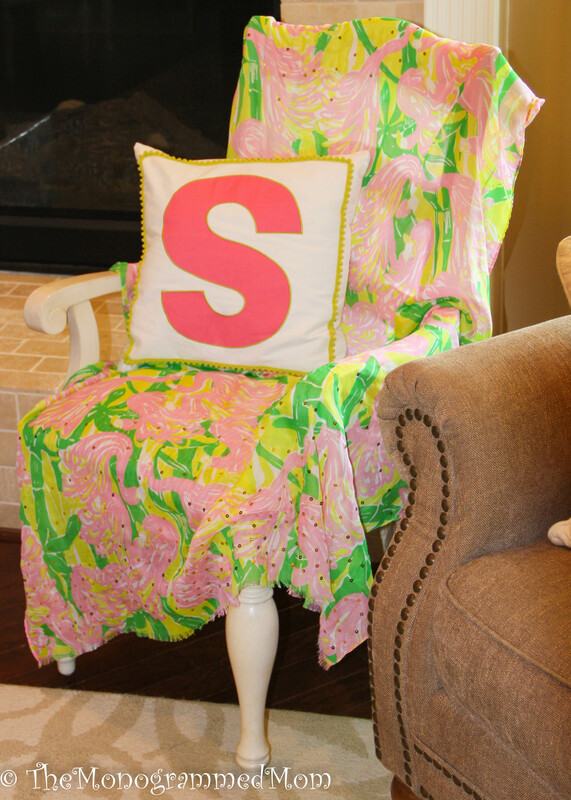 I covered a kitchen chair in a Lilly for Target scarf and topped with one of my monogrammed pillows! 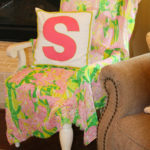 A perfect throne for the guest of honor to open her gifts from! 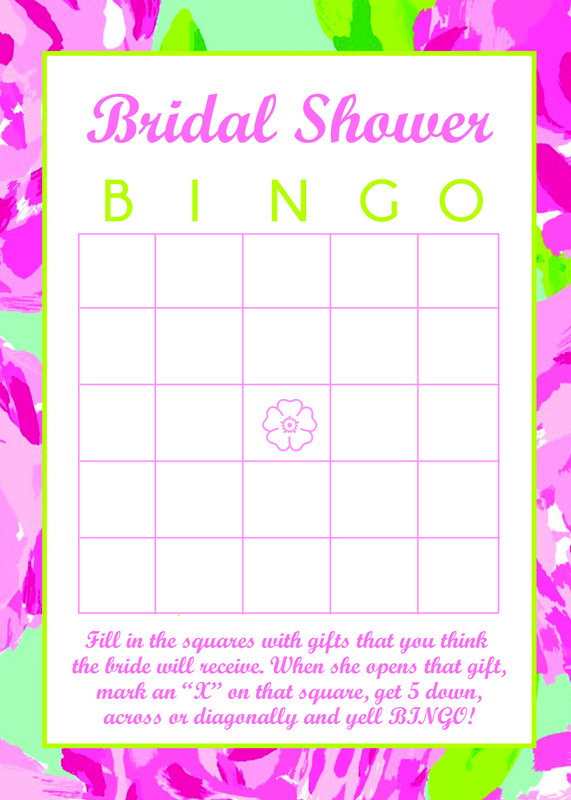 Normally, I’m not a huge fan of games at showers, but in my Etsy search for Lilly, I came across one that I knew would be a hit (while also keeping guests focused on the bride opening her gifts! 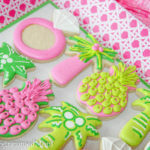 win-win!) 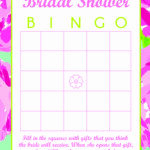 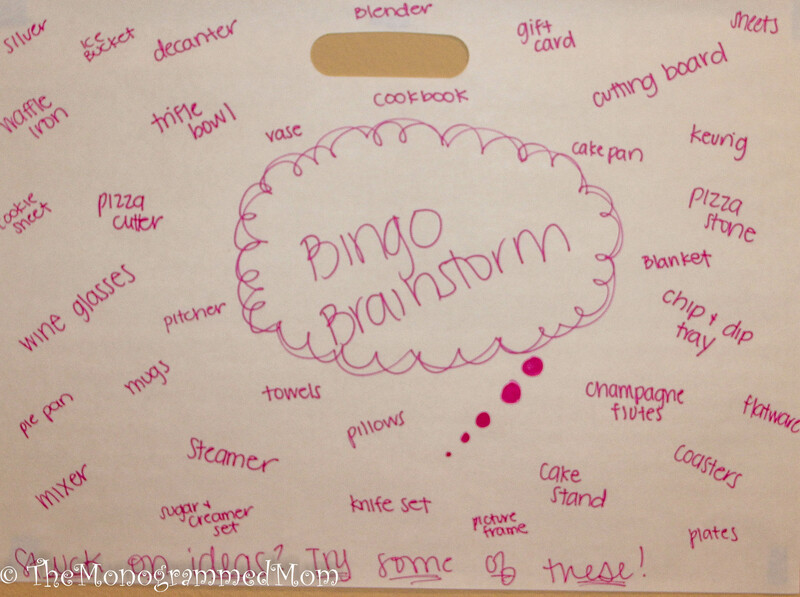 This adorable Bingo was ordered from Etsy shop owner, Destination Invite. 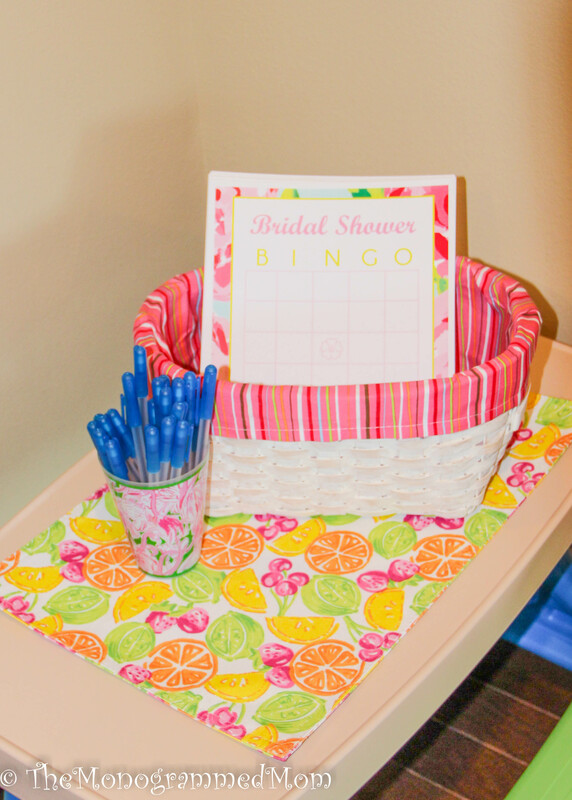 I used the bride’s registry to come up with a “seed” list for our guests. 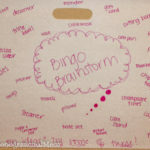 It turned out to be lots of fun, one I’d definitely use again in the future! 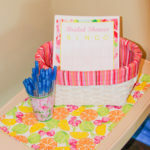 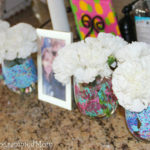 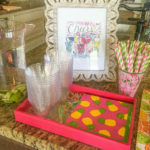 I gave the winner a set of the Lilly wine tumblers, similar to those pictured above with the flowers. 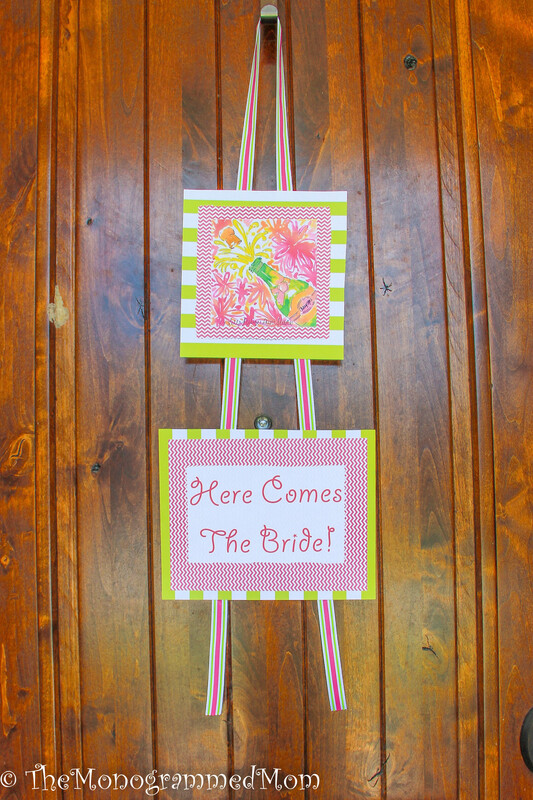 Last, but not least, I created the most precious door hanger for my front door with some ribbon, scrapbook paper and a bottle popping Lilly 5×5 print!